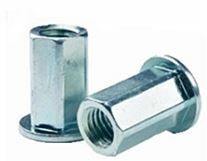 The FHK/FHL series provides increased spin out resistance over round body and half hex body rivet nuts. Proven to meet Class 8 and Grade 5 thread strength. The FHK series has a small flange for a near flush installation. The FHL series has a large flange to provide increased strength in punched and drilled holes.